Study identifies previously unknown role of microglia in neurodevelopment. The brain consists of two major types of cells, neurons and glia cells, which provide support and protection for neurons in the central and peripheral nervous systems. While neurons have been studied for more than a century, extensive glial research has only developed recently. Now, a study from researchers at New York University shows that glia are vital to nerve-cell development in the brain. The team state that this previously unknown source for the brain’s development, offers new insights into the building of the nervous system. The study is published in the journal Science. Previous studies show that glia are not the mild-mannered understudies they appear to be, with some glia even shown to fire electrical signals. For the past few years it has become evident that the functioning of the brain can only be understood if the interaction of all cell types, namely neurons and glial cells, is understood. The current study identifies a role for glia in coordinating neuronal development across distinct brain regions. 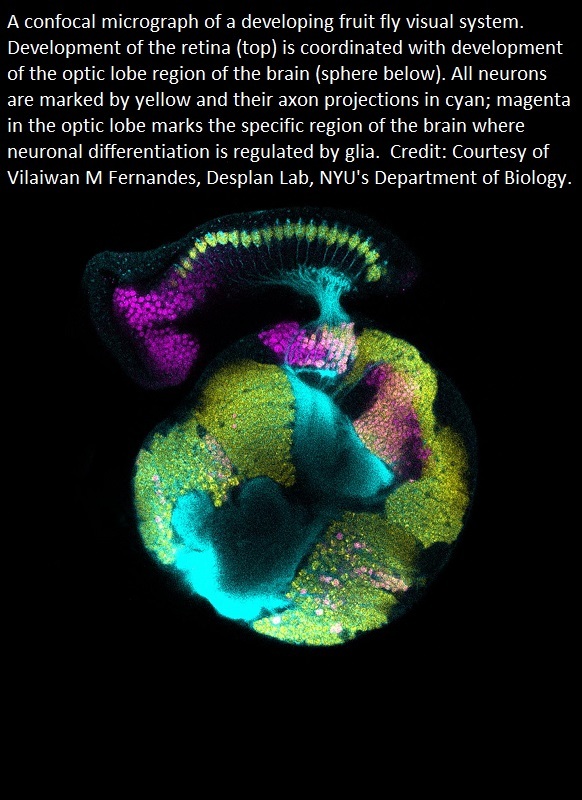 The current study utilises the Drosophila fly visual system to show how development is coordinated to establish retinotopy, a feature of all visual systems. Results show that the coordination of nerve-cell development is achieved through a population of glia, which relay cues from the retina to the brain to make cells in the brain become nerve cells. Data findings show that by acting as a signaling intermediary, glia exert precise control over when and where a neuron is born, and the type of neuron it will develop into. The lab explain that photoreceptors achieve retinotopy by inducing their target field in the optic lobe, the lamina neurons, with a secreted differentiation cue, epidermal growth factor (EGF). They go on to add that in response to photoreceptor-EGF, glia produce insulin-like peptides, which induce lamina neuronal differentiation. The team surmise that their study found that fundamental questions in neurodevelopment with regard to the timing, identity, and coordination of neurogenesis can only be understood when the glial contribution is accounted for. For the future, the researchers state that their results lead to a revision of the often neuro-centric view of brain development to now appreciate the contributions for non-neuronal cells such as glia.